Making upgrades or full replacements to your air conditioning system are good projects to schedule during fall and even winter. After all, you don’t often need the AC working during these seasons, so you can take time to plan for the best outcome and won’t have to worry about being without a cooling system while the work is done. 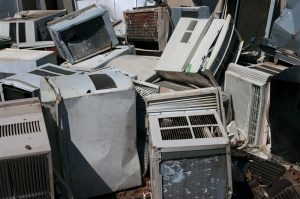 You may be considering putting in a new AC, but are uncertain because you don’t know if your current one is old enough to be considered too old. Below, we’ll look at some of the facts about air conditioning system age to help you think about a replacement. For the Bossier City, LA, air conditioning service from professionals that will make the choice much easier, you only have to call us. First, do you know how old your AC is? If you had it installed, then you probably already know how long it’s served your home. But if the air conditioning system was there when you moved in—an inherited AC—then you may not be as clear about its age. No problem: go to the outdoor cabinet of the air conditioner and find the nameplate located on the back. This nameplate should have a manufacturer’s date on it. If it doesn’t, write down the model and serial number and go to a website for the AC model. You can input these numbers to find the date, which is encoded into them. Now you know how old the air conditioner is. Is it too old? The average life expectancy for a refrigerant-based air conditioner is between 10 to 15 years, with most warranties covering 10 to 12 years. Once an AC is more than 10 years old, it’s in the range where a replacement is usually cost-effective. An AC that is older than 15 years is almost certainly be replaced. Even if it continues to perform, it is at a much higher chance of turning into an energy-waster or suffering a catastrophic failure in the coming summer, trapping you without any cooling. Here’s another way to think about air conditioning age, which is how much the system costs to repair. If you need to schedule fixes for the air conditioner, ask for an estimate from the technician. Multiply the estimate by the age of the air conditioner. Is the result more than 5,000? If so, the repair is too costly compared to a replacement. For example, a $600 repair for a 10-year-old AC (600 x 10 = 6,000) is too much to pay. If any single repair is half the cost of a replacement, then you should absolutely have the replacement. And if the cumulative cost of multiple repairs over a year is more than $500, it’s also time for a new AC. Don’t worry about making the wrong choice about AC replacement—you have our team to help. Before making any decision about your air conditioning system’s future, schedule an appointment with our HVAC techs. They’ll find your ideal new cooling choice. Call the Doctor of Home Comfort: Hall’s Heating, Air Conditioning & Refrigeration.